Today’s guest post is by our board member, Jeanne C. Meister. Jeanne is a Partner at Future Workplace and co-author of the book The 2020 Workplace: How Innovative Companies Attract, Develop, and Keep Tomorrow’s Employees Today. Jeanne thinks a lot about how the workplace is evolving. 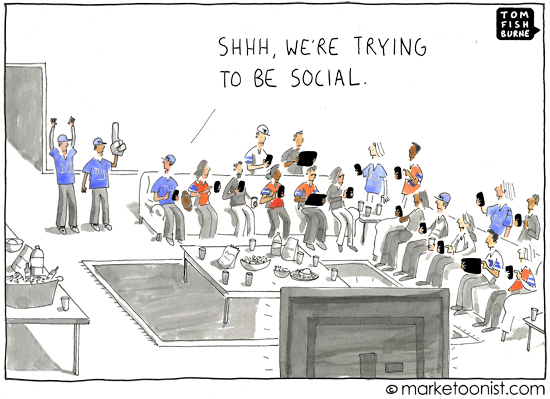 This post examines 7 social trends that will take hold in HR in 2015. In 2014, we saw organizations use social technologies for recruitment, development and engagement practices. The year to come will bring even more transformation to human resources. The year 2015 will see the advent of what I call “the consumerization of HR,” where employees expect an “intelligent mobile user experience” to guide their access to HR resources. Employees will increasingly demand at work the same user experience they get when reserving a taxi on Uber or Lyft, paying their bills on the Bank of America mobile app, or ordering food on Seamless or GrubHub. The mobile interface will be the employee’s primary conduit to a host of personal and business applications; putting pressure on HR to leverage mobile for recruitment, time and attendance, learning, goal setting and internal company newsletters. As a recent MIT Sloan research report showed, 57% of workers now consider ‘social business sophistication’ to be an important factor when choosing an employer. Even more noteworthy: according to the report, “Moving Beyond Marketing: Generating Social Business Value Across the Enterprise”, that group of workers ranged from age 22 to 52! The use of social collaboration technologies in the workplace is no longer a Millennial request. Indeed, today we are all adopting an increasingly ‘Millennial’ mindset. (Millennials are born between 1977-1997). According to the recent Facebook Demographics report, the fastest growing demographic on both YouTube and Google+ is 45-54 years old. This points to the increased computer literacy of an older demographic, as well as the value they put in staying caught up on modern social tools. Sloan’s and Facebook’s research suggest that we are no longer divided into a world of either digital immigrants or digital natives: Instead, we are now all digital citizens. 2015 will be the year HR departments start creating “social employer brand playbooks” to gain competitive advantage in sourcing and developing top talent. Looking at the big picture helps to determine those priorities. Here are seven social HR trends to watch in the coming year as organizations leverage all forms of social collaboration to re-imagine how they find, develop and engage employees. For other companies, developing social ambassadors can start with the commitment to use social media to aggregate all types of inquires from consumers & employees. Often these aggregation platforms are known as “social media command centers,” and they serve to deliver the message that the organization is serious about building its social brand both internally and externally. In 2015, wearable personal tech devices will be on the rise in the workplace. After all, Business Insider Intelligence estimates that the market for wearables will be $12 billion by 2018, and of course much of that will include use on the job. And wearable gadgets have a huge potential to impact workplace productivity. In its 2013 “State of Workplace Productivity” report, Cornerstone on Demand found that 58% of survey respondents said they would be willing to use wearable technology at work if it enabled them to do their job better. Millennials were even more willing: 66% of them reported they were already interested in putting wearables to use at work. I was an early advocate of the power of MOOC’s to transform corporate learning as noted in my Forbes column, “How MOOCs Will Revolutionize Corporate Learning & Development,” (MOOC’s defined early as Massive, Open, Online Courses) As MOOC’s gained traction in high education, forward looking corporate learning officers like Kelly Palmer, the Talent Transformation & Inclusion executive at LinkedIn, saw the opportunity to transform learning by creating a MOOC for LinkedIn’s employees. Palmer and her team saw the design features of a MOOC as a wake up call to re-imagine e-learning at LinkedIn. The result: a cohort-based blended learning program that leverages the best features of corporate MOOCs, Conscious Business taught by Fred Kofman, VP of Leadership & Organizational Development at LinkedIn and author of the best selling book, Conscious Business: How To Build Value Through Values. Palmer shares “We see the Conscious Business course as a ‘pilot in a new kind of blended learning’ where the blend is between learning and work. LinkedIn creates the content and structure and our employees dedicate up to 16 hours over the 4 weeks to bring the principles of conscious business to their jobs. While LinkedIn is on the forefront of the corporate MOOC movement by building their own platform, a number of other forward looking companies are piloting a corporate MOOC by partnering with EdX, Coursera, Udemy, Udacity, and Intrepid Learning, to name just a few of the leading corporate partners. Look for more pilots in 2015! iTunes App Store now has over 1.2 million app’s and has seen 75 billion apps downloaded from the App store in 2014. But what is noteworthy is according to Gartner, by 2017, 25% of all enterprise will have their own Corporate App store. And these app’s will be seamless and live across multiple devices from wearables to phones, tablets and laptops. Consider Cognizant Technology Solutions, which has developed more than 50 apps for its employees’ learning. The demographics of the Cognizant workforce were elemental in their decision to take learning mobile: roughly 99% of the Cognizant workforce is part of either Gen X or GEN Y, with the vast majority, 79%, Gen Y. As I detailed in a previous Forbes column, Lessons from a 2020 Learning Organization, Cognizant is delivering increased amount of learning via apps – which look and feel like iTunes apps, but whose sole purpose is to drive greater interest in continuous learning or what I call, DIY learning. As the US economy returns to growth mode, PwC’s global survey of CEOs finds that 70% of business leaders are concerned about their access to employees with key skills to grow the business, and 53% of these business leaders report that their HR department is not prepared to find, develop, and source new talent. Meanwhile, a host of ‘big data’ recruiting firms is set to benefit from this increased emphasis on using data analytics to find talent. These firms even claim they can tap new talent before it even hits the job market. Talent search engine companies like Entelo, Gild, TalentBin, and the U.K.’s thesocialCV analyze not only job candidate’s Linkedin profile, Twitter feed and Facebook postings, but also note their activity on specialty sites specific to their professions, such as the open-source community forums StackOverflow and GitHub (for coders) Proformative (for accountants), and Dribbble (for designers.) This approach to recruitment is creating a new technical world order, where job applicants are found and evaluated on their merits and on peer-rated contributions, rather than by how well they sell themselves in an interview. Gild has succeeded in partnerships such as the one it forged with Red Hat, a leader in the open-source software field. With a growth rate of 17% in 2014, Red Hat is perpetually searching for top talent, which led it to partner with Gild to identify hard-to-find leaders in the field. “Red Hat’s use of data analytics shows us prospective candidates’ rankings according to their overall expertise level and market demand, and then provides a ranking from 1-100 to indicate their skill level,” says L.J. Brock, the company’s VP of Global Talent & People Infrastructure. “All of this information gives Red Hat the ability to quickly identify highly-ranked candidates, and increase our speed & efficiency in talent acquisition,” Brock says. Red Hat has even adopted a robust change-management and engagement program to encourage the adoption of data analytics by the entire talent acquisition team. NTT Data is one company already seeing results from its strategy of using gamification to develop leaders. Since my column, Gamification for Leadership Development, NTT Data’s Ignite Leadership game has expanded from 70 leaders to over 700 leaders across USA, Canada and India. The game was developed to train leaders in honing five key skills: negotiation, communication, time management, change management and problem solving. During 2014, new incentives were created to motivate employees to complete Ignite Leadership include; receiving 6 hours of training credit towards the 20 hours of mandatory annual employee training, for each participant upon completing the game, plus leaders at each site were recognized for team participation in the game thus reinforcing engagement in Ignite Leadership. Future plans for 2015 include adding more interactivity to the game with immersive and scenario based learning and increasing the scale from 700 leaders to 7,000 adding both more NTT Data employees as well as customer companies. Previous Previous post: Deflategate Hits the Workplace – Where is Everybody?